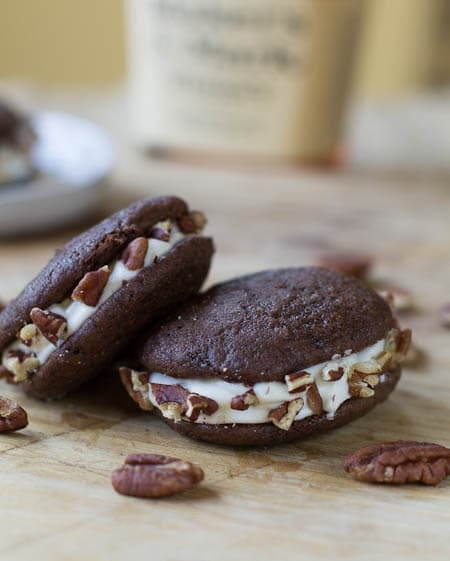 These Whiskey Whoopie Pies are the perfect sweet treat for the bourbon lover and what a great way to celebrate the first full day of fall, or the second, or third. 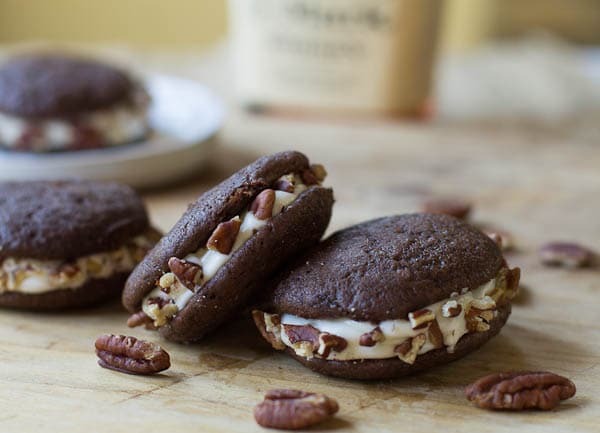 Come to think of it, pretty much any day is a good day for a Whiskey Whoopie Pie. I think I’ve looked forward to fall more this year than any other year. Not sure why. We had a pretty mild summer. As soon as fall hits, I start to want some bourbon. Makers Mark is my favorite. I just love the way it smells and I associate it with fall scents. Every home in the fall should smell like cinnamon, allspice, apples, and bourbon. Ok, maybe not everyone wants their home to smell like bourbon. But if yours does and you invite me over, I’m totally OK with it. 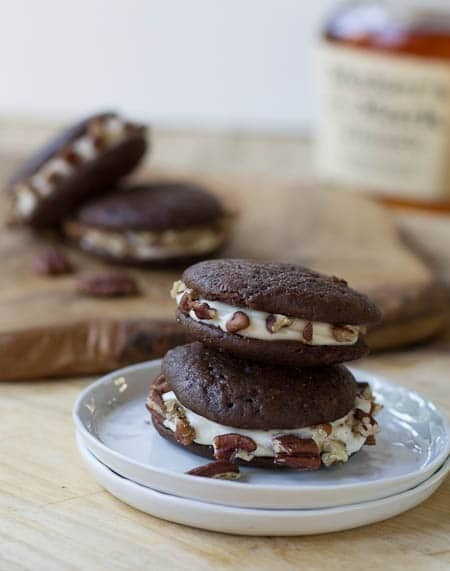 This Whiskey Whoopie Pie recipe is one I’ve adapted from a recent Southern Living Magazine. I’ve been really impressed by the quality and originality of their recipes lately. It wasn’t too many years ago that I struggled to find a single Southern Living recipe that I wanted to try. Now I dog-ear just about every page with a recipe on it. I might have to start cooking 24/7 to try them all. If you are at all interested in southern cooking, you will love Southern Living Magazine. The cookie part is super soft and cakey and the creamy, fluffy filling with a splash of bourbon really hits the spot. They are definitely an adult only dessert, but who says kids get to have all the fun treats? 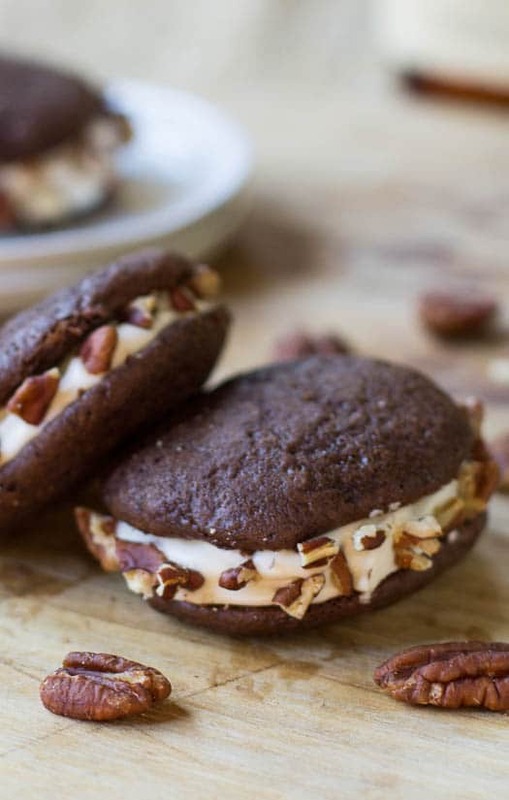 Whip up a batch of these whiskey whoopie pies next time you go tailgating and they’ll be a huge hit. If you’ve never made whoopee pies before, they are super easy. The hardest part is getting uniform sized and shaped cookies. The best way to do this is to scoop the batter with a small cookie scoop like the Norpro Stainless Steel Scoop . Soft, cakey whoopee pies with a whiskey flavored filling are a treat for the bourbon lover. Using an electric mixer, beat both sugars, salt, and butter until light and fluffy. Add egg and egg yolk and beat just until blended. In a medium bowl, whisk together flour, cocoa, and baking soda. Add flour mixture to butter mixture, alternating with buttermilk, beginning and ending with flour. After each addition, beat at low speed just until blended. Drop batter by level spoonfulls using a 1 1/2 inch cookie scoop. If you do not have a cookie scoop, use a tablespoon measuring spoon, but it will be difficult to get uniform cookies. Bake for 10 minutes. Cool on baking sheets for 5 minutes before removing to wire racks to cool completely. For filling, beat cream cheese, butter, and marshmallow cream at medium speed until smooth. Beat in the whiskey. Add powdered sugar 1/2 cup at a time, beating each addition I at low speed so that the sugar does not go flying everywhere. To assemble, place filling in pastry bag or plastic bag with the corner snipped off. Turn half the cookies over and swirl about 2 tablespoons of filling on the bottom of each. Top with remaining cookies. 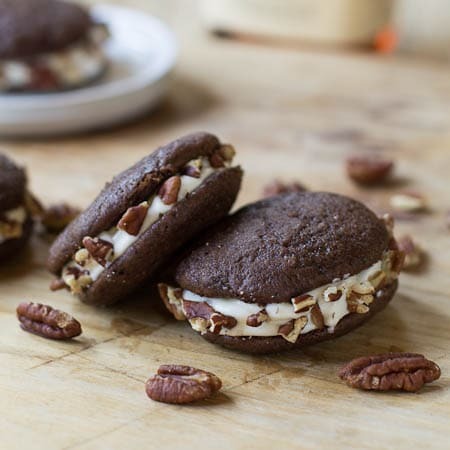 Sprinkle pecans around the edges of the whoopee pies, gently pressing into the filling. 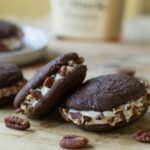 This entry was posted in Desserts, Pies and Tarts and tagged bourbon, southern desserts, Southern Living, whoopie pies. Bookmark the permalink. I made these for a baby reveal party. I used a Babycakes Whoopie Pie Maker. It makes little bite sized 2 inch pies. The first batch I used baking powder as the ingredients show, but the directions show baking soda. After looking at the Southern Living recipe I used baking soda for the second batch and they were more fluffy and light. No problems – I used the first batch for the kids, changing the filling from 2 tablespoons of whiskey to 1 teaspoon of pure vanilla. I made the others with whiskey for the Dads and non-pregnant adults. One thing I changed – the filling didn’t have enough of a whiskey flavor, but the more whiskey I added made it too thin and I’d have to add more powdered sugar which dulled the whiskey flavor again. Finally I got the idea to roll the chopped pecans in whiskey before rolling them on the edges of the pies. I poured just a few drops of whiskey onto a saucer and then started adding pecans, rolling them around and adding more until they weren’t too damp to the touch. They were a huge hit! Thanks so much for the recipe! I’m getting ready to make the Southern Living version since I didn’t find this adaptation until right now. I made the cookies last night. Do you think I can make the filling today and then put them together before Super Bowl? I would let it come to room temp before trying to spread. Can’t wait to try your version next! I think you could make the filling ahead of time. If it’s too difficult to spread, use a pastry bag or a ziptop bag with the corner snipped off to pipe it on the cookies. It was fate because I had 3 other dishes to make so was busy anyway on Sat. And waiting till Sunday let me get the marshmallow cream. Perfect! That was a great adaptation. It made the consistency so light. Everyone raved about how they turned out. Thanks you! Yay! So glad everyone enjoyed them! Three other dishes? You must have had one heck of a party! Oh wow! That’s a big mistake on my part! 1/2 cup butter, softened. Sorry! I probably totally messed you up! Love baking with whiskey! It adds such great flavor! Makers Mark is one of my faves along with Woodford Reserve. So much fun baking with whiskey! I love Woodford Reserve too! I would like to make it real soon. You got me when you said the cookies are gooey. Did you make whoopie pies even MORE awesome?! I think so!! These sound so great! I’ve wanted to try whoopie pies for a while now. I do have a cookie scoop, too, so I’ve got no excuses. Sounds like I need to give Southern Living Magazine a try! Yes you need a Southern Living Magazine to try. Their cookbooks are fabulous too! You had me at whiskey! Forgot to say – I’m sssooo pinning! Pinned! Oh my gosh! Ask me how much I love this recipe! I’ve never had Makers Mark, but I’ve always been tempted, because it’s the preferred drink of choice of one of the Private Investigators in my favorite series of mystery books! Makes me want to try it even more because you’ve put it in a Whoopie Pie! Love it! That Private Investigator knows a good drink! Oh boy — these look and sound really, really awesome! I love the flavor combination. Gah – these look good – soooo good! Ha! I totally bookmarked this recipe too in Southern Living! Now I want to make them even more after seeing them! My father-in-law would love these – thinking about trying them out soon! Give them a try Ashley! They are awesome!